Kentucky Thunder's Paul Brewster Releases "3 Minute Heartache"
Long time Kentucky Thunder member Paul Brewster is set to release his new CD, 3 Minute Heartache on September 10th! The new CD features 10 new original country songs written by Paul. "This is a great country album" says Nashville music icon Bob Tubert. The album features something for everyone; The bluegrass fan favorite "Bluegrass Melodies"...the western swing "Hillbilly Blues", the rollicking "Too Country", the poignant and haunting "Dad's Guitar", the humorous ode to the internet, "Love On Line", and among others, the wistful title cut, "3 Minute Heartache". Brewster's vocal skills are legend... and now... finally exposed... his song-writing genius. Read more about Kentucky Thunder's Paul Brewster Releases "3 Minute Heartache"
Join award winning bluegrass artists Dailey & Vincent a their Dailey Vincent Fest in Denton, NC September 20 & 21. The fest is two days of laughter, great music and family memories at the beautiful Denton FarmPark in Denton, North Carolina. 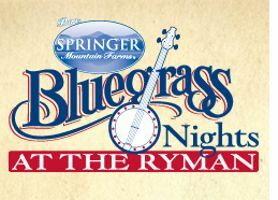 Hosts, Dailey & Vincent, will be joined by Ricky Skaggs & Kentucky Thunder, Comedian James Gregory, Della Mae, The Seldom Scene, Comedian Aaron Wilburn, The Quebe Sisters, David Peterson & 1946, The Grass Cats and more.